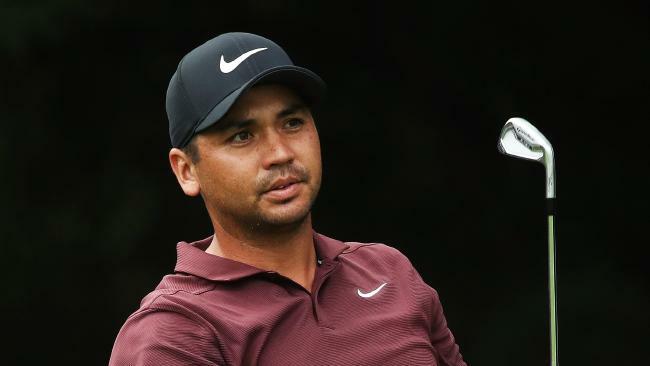 JASON Day hopes the equal-best iron-play performance of his US PGA Tour career is the spark he needs to ignite a FedEx Cup play-offs charge after his slow start to the finals. Day fired a six-under-par 64 on day two at the BMW Championship - his best score in this year's edition of the $US67 million finals - to sit four shots off the pace at Philadelphia's Aronimink Golf Club. American Xander Schauffele surged into the outright lead at 13 under courtesy of a 64, which has him in the driver's seat at the elite 70-man BMW - the penultimate playoffs event. Tiger Woods was unable to emulate his storming opening round of 62, with his even-par 70 dropping him to 12th spot on the leaderboard. The woeful performance on the greens prompted Woods to spend considerable time practising his putting after the second round. Day, the 2015 BMW champion, hit all 18 greens in regulation for just the second time in his 12-win US Tour career. The only other round where the Queenslander was perfect with the irons was the final day of the 2016 Tournament of Champions in Hawaii. Day hopes his irons masterclass can ignite his playoffs hopes following a lacklustre result at the Northern Trust event and a missed cut at TPC Boston last week. "Man I hope so, I really do," Day told AAP. "I felt like it was coming for a while because I've been working hard on the irons. "I think it was a good step in the right direction and now I'm really looking forward to the weekend." Day, ranked No.1 on the US Tour for strokes gained in putting and around the green, said improved iron play could only lead to success. "I know I'm capable of low scores but the calibre of players on this BMW leaderboard is so high," he said. "I'll need to be on my A game if I want to have a chance to win." Day's countryman Marc Leishman, the defending BMW champion, clawed his way back up the leaderboard with a 66 but is still languishing at even par. Leishman is projected to need at least a tie for 38th to remain inside the FedEx standings's top 30, who advance to the Tour Championship finale. Cameron Smith (71) and Adam Scott (68) round out the Australian contingent and are both at two-over for the tournament.